Aloine was born in Sweden. She began her career as a Dental Nurse and then qualified as a Hygienist in 2000. 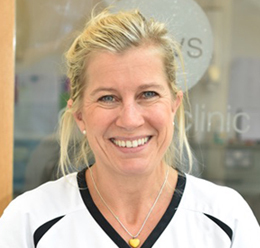 Throughout the course of her 20 year professional career she has worked full-time and part time in various practices in Surrey and now works in Great Bookham and Cranleigh alongside her work here at The Mews. She is fully qualified in local anaesthesia, x-rays and impression taking and regularly updates her professional development with courses. She is also a member of the British Dental Hygiene Association. She lives in Cranleigh with her Husband and twin boys, born in 2007. A keen rock climber and skier, she also likes cycling, practicing Pilates and gardening.